Monday, October 5th, is the birthday of Larry Fine of the Three Stooges. He would have been 108 years old in the unlikely event he had lived so long. As it is, we lost Larry (born Louis Feinberg in Philadelphia) in 1975. Larry and fellow Stooge Moe Howard died only a few months apart - '75 was a bad year for Stooges aficionados, which at the time I was. In the seventies you couldn't turn the TV dial without finding a Three Stooges short at least once a day. In the seventies you actually turned a dial to change channels on the TV. What's more, the number of channels available was far less than what actually fit on a dial that went from 2-13 (and if you want to know why the old TV dial went from 2-13, click here). In any event, like all children of the 1970s, I watched the Three Stooges a lot. It's a damn shame they're rarely shown on TV any more; they're overdue for a revival. Beloved Spouse and I bought a DVD not too long ago to introduce Precocious Daughter to the Stooges. Being a child of extraordinary discrimination and taste - not to mention an extremely goofy sense of humor - PDaughter immediately fell for their antics. What's not to love about pie fights or hearing Curly sing "Laaa-DEEEE" as he works at some hopeless task? Larry anchored the Three Stooges. He was there through the Curly days, the Shemp shorts, the Joe Besser and Curly Joe DeRita eras. Moe was too, of course, but as Homer Simpson so sagely observed, "Moe is their leader." Larry commanded a much smaller slice of the spotlight with his laid-back persona and vain attempts to be the voice of reason amid the chaos of his cohorts. But he was essential to their appeal with his freaky hair and bug eyes and drawling delivery. Oh, Larry Fine's voice. When I've had, er, a bit to drink, I break out a mean (but not mean-spirited) impression of Larry, based on a famous interview he did a few years before his death. It's excellent, and may you someday be privy to it. But the best known imitator of Larry's distinctive drawl is Billy West, who not only did a killer impression of the man back in the day, but also based his portrayal of Stimpy the Cat on the middle Stooge. But the hairball-prone kitty, even with a voice evocative of Larry's, can't hold a candle to the original. In closing, I'd like to say it's a damn shame that Sean Penn dropped out of the planned Three Stooges movie. It would have taken an actor of his caliber to fully embody the qualities that made Larry great. (Paul Giamatti has been announced as his replacement, and although he too is a fine [no pun intended] actor, I would have loved to see what Penn could do with the part.) 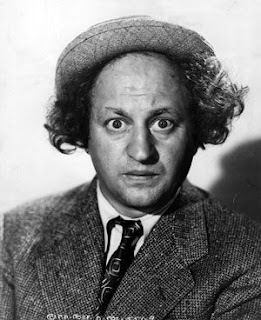 Larry Fine: skilled violinst, loving husband, and one funny Jew. Happy Birthday, Porcupine!